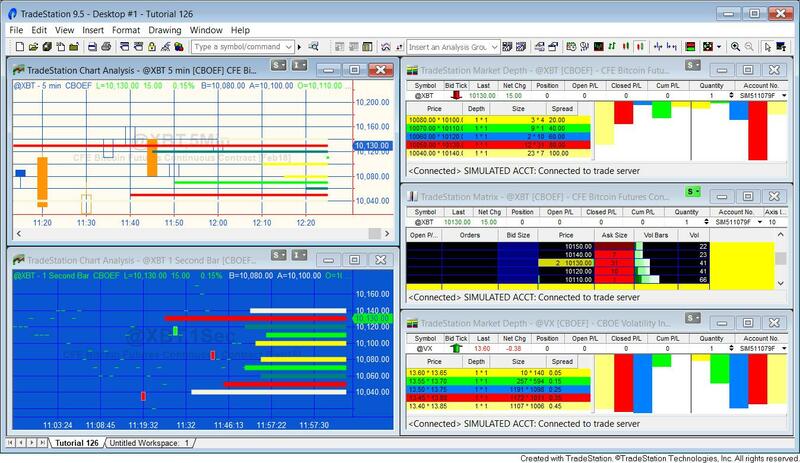 Tutorial 126 demonstrates the TradeStation market depth provider. Unfortunately this functionality is not available in MultiCharts. In order for the tutorial to function it needs to be applied to a symbol for which you have market depth data. In addition, these examples use CBOE futures where the number of participants at each level are equal to 1. This tutorial is organized in two parts. The first part builds and explains _Tutorial126_Simple. In the second I talk through the more complicated _Tutorial126. _Tutorial126_Simple explains how relatively easy it is to call the Market Depth Provider and to plot three levels of bid pricing in real time. Gold Pass members can download _Tutorial126_Simple for free. The UNPROTECTED TradeStation indicator ( _Tutorial126_Simple) is available for IMMEDIATE download for $4.95- by clicking the ‘add to cart’ button. N.B. The more complicated tutorial program that creates the histogram is available below. Gold pass members, make sure that you are logged in to download the _Tutorial126_Simple for free. _Tutorial126 also uses the Market Depth Provider but in this case the price and size information and drawn on the chart in the form of a histogram. The lines are positioned at the level of the inside bid and the next 4 bids and at the level of the inside ask and the next 4 asks. The length of the lines are proportionate to the size at each bid or ask level. The lines are updated and moved whenever the underlying market depth data changes. _Tutorial126 creates a Market Depth Provider for the symbol of the chart to which is applied. When first applied to a chart (or when refreshed) the program creates a vector and populates it with five color objects. It then uses a For loop to create trend trend lines which it positions in arbitrary positions (the lines are re-positioned when the Market Depth Provider update event fires). Each line is given a color from the color palette vector, depending on its bid or ask level. In the example, the inside bid and inside ask are colored yellow, the next levels green etc. The thickness of the lines is set by the user input: HistWeight. The other user input: Scale, determines the length of the histogram bars. The bars are equal to Scale multiplied by the size of the level, expressed in minutes. For this reason, the program makes most sense when applied to a intraday time based chart with the scale adjusted depending on the length of the bars. Occasionally Market Depth Providers for stocks and futures gives crossed bid/ask values. If you wish to save yourself some time typing in the code for _Tutorial126, the UNPROTECTED TradeStation indicator ( _Tutorial126) containing tutorial program (i.e. the EasyLanguage is fully functional and you can see the source code) is available for IMMEDIATE download for $29.95- by clicking the ‘add to cart’ button. The program works with TradeStation, but not MultiCharts.